This year’s LeeFest marks the 10th anniversary of the independent arts festival, which started in 2006 in founder Lee Denny’s own back garden. 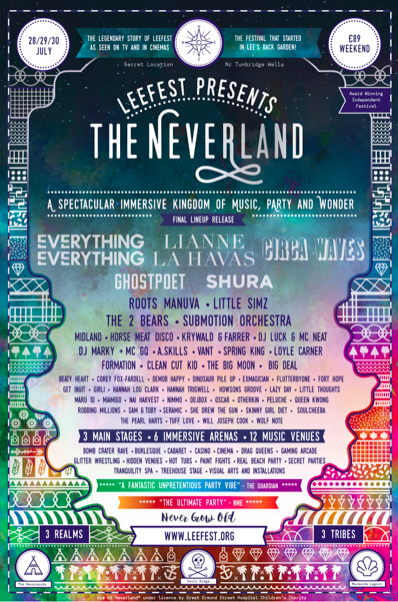 Dubbed LeeFest Presents: The Neverland, the festival’s motto this year is “Never grow old”, and it promises a “stunning musical lineup” along with a host of other wide-ranging entertainment opportunities. The exact location of The Neverland’s new secret venue and campsite near Tunbridge Wells, about an hour southeast of London, will only be revealed to ticket holders near the time of the event, which is scheduled to take place on the 28th-30th of July. What we already know about LeeFest 2016 is that its strong live music lineup presents an enticing mix of established artists and up-and-coming acts. Headliner Lianne La Havas could possibly fall into either category, after her breakthrough 2012 album ‘Is Your Love Big Enough?” She is currently supporting Coldplay on their ‘A Head Full of Dreams’ world tour and is scheduled to open for fellow soul singer Leon Bridges on his September and October dates in America. La Havas released a new EP ‘Blood Solo’ back in February, providing solo interpretations of tracks from her second full album ‘Blood’, as well as the delicately haunting new track called ‘Fairytale’, which you can hear just below. In contrast to La Havas’ soulful folk stylings, Liverpool rockers Circa Waves join the LeeFest headline bill in the midst of their own summer festival circuit. 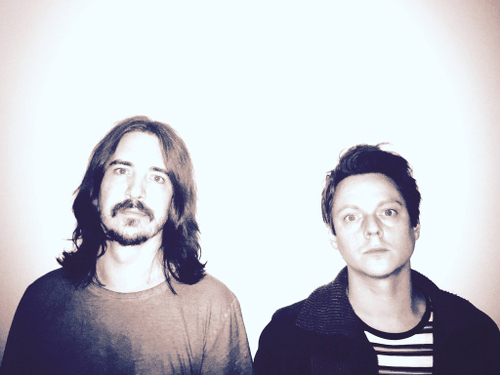 They recently appeared at Live at Leeds 2016 and will grace their hometown stage at Sound City 2016 at the end of this month. Circa Waves have been quiet so far in 2016, but their emergence back onto the live scene, including a handful of upcoming headline dates around the UK, might be a hint that something new from the band is forthcoming. In the meantime, you can get in the festival spirit with their video for ’T-Shirt Weather’, which featured on their 2015 debut album ‘Young Chasers’. The LeeFest 2016 docket features a wide array of other artists previously covered here at TGTF, most notably 2015 Mercury Prize nominee Ghostpoet. The LeeFest lineup also includes a lengthy list of our SXSW 2016 alums: Manchester art-rockers Everything Everything, dance pop duo Formation, Liverpool’s own Clean Cut Kid, indie pop wunderkind Oscar, Kent ‘dirty-pop’ bangers Get Inuit, Sheffield rock duo Nai Harvest and Tunbridge Wells native Will Joseph Cook. The live music portion of the festival will also include DJ sets from Submotion Orchestra (pictured above), The 2 Bears, Midland and Horse Meat Disco. Aside from the musical festivities, LeeFest also offers a variety of other entertainment categories comprising Comedy, Spoken Word, a generic Performance classification, and the very curiously-titled Sillyness. Divided among three so-called “realms”, The Neverland aims to provide “immersive adventures at every turn”, even including a Family category for arts enthusiasts with young children. As a preview of the main event, LeeFest: The Neverland is partnering with the Tunbridge Wells Forum for a free festival launch party featuring a surprise headliner starting at 6 PM on the 3rd of June. Keep your eyes on LeeFest’s official Facebook page and Twitter feed, which are being updated with further details as the 2016 festival approaches.